The former Provincial Director of Culture of Konya, Güner Özkan, assembled around 300 different musical instruments over the course of the past 50 years and is now presenting them in exhibitions in various Turkish cities as well as at renowned international venues such as "The Art Institute of Chicago," the French exhibition hall "Grand Palais" in Paris or the "Museum Arnold Vander Haeghen" in Ghent, Belgium. Özkan, who told Anadolu Agency that he had fostered his interest in musical instruments since his childhood, concentrating first on the "Sipsi" (a small, clarinet-like reed instrument), and the "kaval" (a wooden flute similar to the better-known "Ney"), intensified and systematized his endeavors for the preservation of traditional Turkish and Middle Eastern musical instruments when he became the Provincial Director of Culture in Konya in Central Anatolia at the age of 34. He then expanded his love for musical instruments, reaching out to lesser-known instruments of the Turkic world such as "Dombra" (a Turkic lute), "Kopuz" (also called "Komuz", a fretles Turkic lute used in Central Asia), "Rebab" (a kind of fiddle), "Santur" (a hammered dulcimer) and the "Kaşgar Rubab" (an instrument that, differing from the "Rebab," is plucked and which, among other places, is played in the Kashgar city in Eastern Turkestan). He has also collected instruments from places he was assigned to as a civil servant, as well as during his trips abroad. Some of the instruments in his collection are reportedly older than 100 years. For instance, one of his historic pieces is a "Çöğür," [also written as Choghur] (a plucked string instrument used in the Southern Caucasus), dating from the 1890s. He also added some old Turkish wind instruments which he manufactured himself. 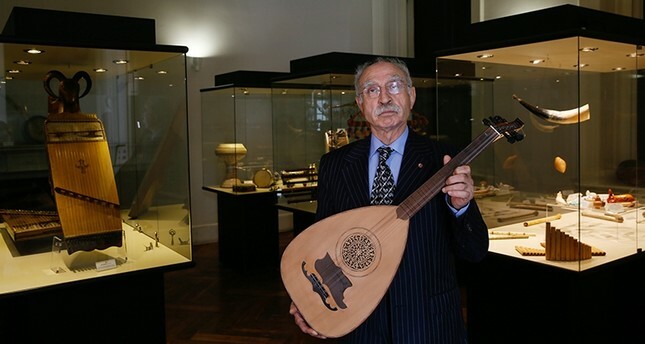 Over the course of the years, Özkan was able to assemble a large range of musical instruments, which he carefully preserved and maintained and later on donated to the "MÜZİKSEV" Music Museum and Audio Collections of Izmir. His collection is also exhibited in Turkish cities like Balıkesir, Burdur and Nevşehir, and in addition to the aforementioned international venues, has also been shown in Japan, Italy, Germany and China.